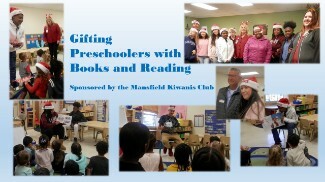 This year, The Phoenix Academy partnered with the Mansfield Kiwanis Club to organize an early childhood literacy event. On December 14th, Phoenix staff and students visited the Mansfield Head Start and Child Development Center. Preschoolers attending the center were each given a gift wrapped book. Students from the Phoenix Academy also read books to the preschoolers.